I did a “tour” of the Big Brother – Big Sister program this evening. Really inspiring. I’m already trying to talk two great people into being Big Brothers. Boys make up 80% of the program’s waiting list. One “Big” talked to us about the extraordinary effects he has had on his “Little” – and vice-versa. His young friend has had all kinds of experiences that would not have been part of his life otherwise – amazing stuff like Red Sox games, and stuff many of us take for granted, like going to the library, eating in a restaurant or exploring the UMass campus. Now he wants to go to college and be an engineer. He’s ten years old. Before the match with his Big Brother three years ago, college was simply not in his family’s orbit. And the Big Brother says that he can’t imagine life without his friend. The young boy was part of his wedding. When the “Big” was on vacation, he called the “Little” because he missed him, and he missed being involved with what the child was doing. They told us that people worry that they don’t have enough time to do this, but the folks from the program said that you schedule the time – a couple hours, once a week – just like you schedule everything else you do, and they said it soon becomes a regular part of your life – and one that you treasure. How cool is that? Imagine how big a difference you could make in a kid’s life just by being an attentive, reliable and dedicated friend. “Improved self-esteem” is cited as one of the major benefits for the children. If this piques your interest at all, get in touch with the program’s Director, Renee Moss, at 253-2591. You will be so impressed by how thoroughly they research and interview the kids and the mentors to ensure a good match. In fact, Renee said that it would be better for a child to have no match than to get a bad match, because these kids often come from lives with a lot of disappointments. The efforts that go into making the match, and supporting it – with constant follow-up to make sure it’s working, events and activities to keep things interesting, and generally keeping the “Big” and the “Little” close in the program’s “family” – will really blow you away. If you can’t be a “Big,” there are other ways to help. Money – always needed! – funds the staff that make and support these matches, and that is a lot of work. Free tickets to events, activities and venues is a huge help – “Bigs” can’t necessarily afford to fund the fun of this relationship. There are other needed supplies and ways of helping out that Renee would be happy to share. Don’t forget the number: 253-2591. 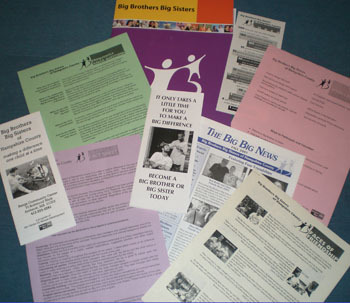 Or check out their web site: www.bbbshampshirecounty.org.